If you don’t get into the field too often, then you may be surprised to know that many towers and rooftops require cranes. Yeah, no joke, it’s true; cranes make construction jobs much easier. Why are you looking confused like that? Oh, okay. No, not those birds with the goofy long legs. The construction equipment capable of lifting and lowering heavy materials. You know, the machines that have been around since Ancient Greece? See, the confusion comes because they both have the same name. While cranes make the impossible possible, their hazards cause severe injuries and fatalities every year. Preventing these disasters requires operators and workers to maintain focus and follow safety protocol as they would around any heavy machinery. The three common concerns most frequently associated with crane accidents are: overloading, electrical hazards, and materials falling from overhead hoists. One overlap between all three hazards is the qualifications of the crane operator. No variable is as important as assuring the crane operator/job supervisor is competent and qualified: no dummies allowed. Swinging or a sudden dropping of the load, using defective components, and hoisting a load beyond capacity can all cause overloading. According to OSHA (who knows these things well), 80 percent of all crane upsets and structural failures can be attributed to exceeding the crane’s operational capacity. One overloading accident occurs for every 10,000 hours of crane use, and nearly all of these upsets can be attributed to human error. Overloading most often occurs when poorly trained personnel are allowed to operate cranes. For example, operators may mistakenly believe they are able to rely on their instinct or experience to determine whether a load is too heavy: no cowboys allowed. Because cranes have become more and more sophisticated, today’s operators must be well trained and have a clear understanding of load dynamics, lifting capacity configurations, and the conditions under which such lifting capacities are valid. Nearly 50 percent of crane accidents are the result of machinery coming into contact with a power source during operation, which most often occurs when the crane is operating nearby or under energized power lines. Usually, the person who is electrocuted is physically touching the crane when it comes into contact with the power line, but the danger extends to all personnel in the vicinity, not just the operator. Okay, here’s the trivia question, for a chance to win some Towersource apparel and a gift card: during what war does Stephen Crane’s “The Red Badge of Courage” take place? Send your answer to nsavage@towersourceinc.com. Nobody wants an antenna tumbling down inside a compound. If materials are not properly secured, a crane’s load can land on workers or cause major equipment damage. One way to reduce the risk of runaway materials is to perform regular maintenance, but aside from preventative care, if the load isn’t properly secured, objects can tip, slip out, and eventually crash to the ground below. Employees working around cranes should always wear proper head, foot, hand, and eye protection. While the crane operator should always be accountable, anyone on the ground should also be aware of his/her surroundings and never walk under a lift. Likewise, suspended loads should never be moved over employees, even if it seems hilarious at the time: no pranksters allowed. This must be what Donald Trump means when he talks about making America great again: though download speeds of 4G LTE networks rose slightly in the U.S. over the last year, we’re now ranked 55th in overall LTE performance. The drop comes as other countries rapidly improve their networks. Per network monitoring app OpenSignal, New Zealand has the best LTE network. The Kiwis and their sheep enjoy speeds 3.5 times faster than those in the U.S. Also impressive: South Koreans have LTE coverage 97% of the time. Before you get up in arms wondering why Morocco—Morocco!—outperformed us, keep in mind the study strictly graded LTE performance, not LTE coverage. The U.S. is actually hindered because of our size and the fact that we rolled out LTE first: Verizon launched the technology back in 2010. That means countries like Japan and Australia are using newer, faster equipment. For the record, Verizon customers enjoy LTE coverage 84% of the time, the highest rate of any carrier. They are also tied with T-Mobile for fastest overall LTE speeds. What's the best reason to get married? For money and a secure future, right? Sprint has improved in many respects over the last year, from ditching those annoying family plan commercials to increasing their coverage. Regardless, they're now fourth in the market and looking at a 52-week low stock. In the midst of success, potentially crippling failure. Sprint's setback could be the key to getting a Sprint/T-Mobile merger off the ground, though, as RCR Wireless reports. The two giants tried to merge in 2014, but regulatory killed the deal. Maybe with a puttering stock, the deal will be viewed more positively. It definitely will be successful if they hire Kevin Durant to represent them. We'll deliver the good news first. 3M, the mega-corporation everyone loves for their diverse product line (everything from stethoscopes to camouflaged hockey tape) is investing in the tower climber safety industry, to the tune of $2.5 billion. What does $2.5 billion get you? It buys the fall-protection equipment supplier Capital Safety, whose products include harnesses, lanyards, and retractable fall arrest devices. 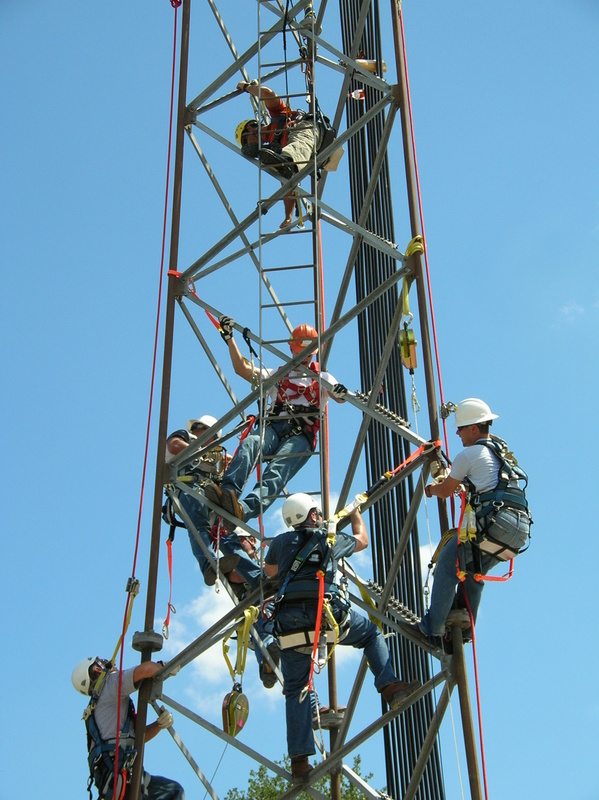 According to RCR Wireless, "This is a strategic move for 3M, which believes increased regulatory focus on tower worker safety in both developed and undeveloped countries will push the growth of the industry." Don't believe RCR? Take it straight from 3M's mouthpiece, Inge G. Thulin, 3M chairman, president and CEO: “Personal safety is a large and strategically important growth business in the 3M portfolio. The acquisition of Capital Safety bolsters our personal safety platform and will build on our fundamental strengths in technology, manufacturing, global capabilities and brand.” Let's hear it for corporate talk! Okay, so that's the good news. Now, how about the weird news? To be more precise, it's weird, slightly unsettling news. Anonymous, a hacktivist group (that's hacker activists, for all those not in the know), posted a threatening YouTube video earlier in June warning tower industry trade associations to... well, it's not really clear what they're warning against. You can check out the video here, if you want the heebie-jeebies. What's even weirder? We headed over to Cellular News this morning, and found it hacked by Anonymous. These are strange times we're living in! "Jonathan Schildkraut at Evercore ISI: “We see a number of potential strategic benefits from the proposed combination: (1) significant spectrum resources (T-Mobile has roughly 84MHz of spectrum and Dish has roughly 81MHz with both having concentrations in the AWS and PCS bands plus a little 700MHz); (2) ability to deliver wireless broadband to rural markets (markets to which Dish customers are over-indexed); (3) add significant spectral capacity to TMUS’s network in urban and more densely populated sub-urban markets; and (4) a strong cultural fit (based on market disruption and addressing customer pain points)… Dish generates a fair amount of FCF [free cash flow] on its core business, while T-Mobile is expected to inflect to FCF positive in 2015. The combination of growing cash flows would allow for more aggressive network investment – particularly in markets where T-Mobile may need additional scale (i.e., more rural markets)." Just last week, we brought news of Sprint's bold claim to soon have the best coverage. The company then reigned those boasts in by describing their plans fully: they plan to be first (or second) in coverage (in major markets). In order to do accomplish such a feat, Sprint asked its parent company, SoftBank for approval and funding, not unlike the well-behaved teenager asking his parents to stay out past curfew on the night of the big game. Per FierceWireless: "Sprint has developed an approved network plan in partnership with SoftBank that will allow for a cost-effective network build on an accelerated timeline." Let's see: "Cost-effective." "Accelerated timeline." "Approved." Buzz word alert! "Internet connectivity has reached its 25th year. Mobile devices are now affordable and in ample supply, while mobile networks are keeping pace with the latest networking technologies. Consumers in the U.S. and Canada, alongside other developed markets, have passed the introductory phase of the Networked Society. The pervasive connectivity of people and devices is transforming our lives, including our homes, jobs, health, relationships and more. In 1990, the internet had existed as a public resource for less than a decade, and almost 80 percent of the world’s internet users resided in the U.S. or Canada. Now, 99 percent of households in the U.S. have at least 1 device connected to the internet and nearly 50 percent have 5 devices or more." By 2020, there will be one smartphone subscription per person. By 2020, data traffic will increase 7.5 times to the equivalent of about 4.2 billion movie downloads. Two years ago, less than 50% of employers provided a data plan and device for at least one employee. In 2014, 75% of businesses did the same. In 2014, there were approximately the same number of households with a tablet as with a landline. *Our boss bought us a word-a-day calendar. He only just gave it to us, even though it's June. Clickbait apparently works, so we’re trying to increase the views of our Safety Newsletter with that headline. Did it work? Are you here to find out whether or not Chris Pratt’s lower back is overly stressed? His back is fine, as far as we know, and while you may not get celebrity gossip here, in issue #4 of our newsletter, you will learn about the ergonomics of safe lifting. And don’t forget about the hidden contest! How Much Do You Know About: Lifting Ergonomics? We can admit it; we didn’t even know the definition of “ergonomics” at first. So we had to look it up. For our purposes, ergonomics refers to the study of human capabilities in relationship to their work demands. Boring snoozefest. Translation: if you slouch while staring at your computer or your back hurts from sitting in your cubicle all day, ergonomics should interest you. But we’re not here to focus on the coddled 9-to-5 desk jockeys. We’re here to focus on the diligent field crews who lift more than just a doughnut all day. Working on-site requires heavy lifting, which can cause strains or hernias or other types of Musculoskeletal Disorders (MSDs). These MSDs are injuries that affect muscles, nerves and tendons, and include injuries to the neck, shoulders and lower back. According to OHSA, MSDs are one of the leading causes of lost workday injury and illness. ·Good foot position allows you to keep your balance and to use the full power of your legs, which are more powerful and more durable than your back. Footwork is also important to avoid twisting your upper body. Twisting compounds the stress of the lift and affects your balance, so use your feet to change direction; don’t twist your body. ·Whenever you lift an object, the load becomes a part of your body. You support and propel the object while it is attached to you. This attachment should be firm and secure—get a good grip. ·Use the right tools! Man invented forklifts and dollies for a reason; they separate us from the apes. So when really heavy items need to be lifted, use your tools! Even simple mechanisms like back belts or wrist braces prevent injury. ·Lifting isn’t always a hardship. Some people even do it for fun. Mariusz Pudzianowski competed in the World’s Strongest Man competition nine times—and won five of those competitions. Here’s your trivia question: plus or minus 50 pounds, what was Mariusz’s highest bench press? Send your guess to nsavage@towersourceinc.com, for your chance to win a gift card and a Towersource polo! ·When you have someone help you lift an object, teamwork becomes important. If you're going to be carrying a load from one point to another, both of you should decide how to handle the load in advance. Check the route and clearance. One person should be the leader. Lifting and lowering should be done in unison. Don't let the load drop suddenly without warning your partner. A zebra can tell you it's going to add more black stripes, but that doesn't mean you can't be skeptical about its claim. Take a moment to admire that analogy, then check out Sprint's equally as bold claim, reported by CNET. In two years, they're going to have the first or second best coverage in major markets, according to CEO Marcelo Claure. Hey, we're all for dreaming big. More competition leads to better experiences for the end user. So, young zebra, go forth and make good on your claim! Full CNET article can be found here. "Talk about bold. Sprint Chief Executive Marcelo Claure said he believes he will have a top-tier wireless network in less than two years. "You can invite me back here in two years -- our network will be ranked No. 1 or No. 2," Claure said Wednesday at Recode's Code Conference in Rancho Palos Verde, Calif. He later clarified that he meant No. 1 or 2 in the major markets. It's a tough claim to accept, given that Sprint is ranked in many network surveys as dead last -- particularly in data speeds. Though recent studies have shown improvement in phone calls and text messages, Sprint still lags behind the competitors in coverage -- especially in many major markets. Verizon typically takes the top spot for wireless coverage, with AT&T close behind. T-Mobile lays claim to the fastest network. Claure, who took over Sprint last summer with the mission to revitalize the struggling carrier, gave his prognosis of the company. "The patient is doing well now, and I think the patient is in stable condition," he said." If we asked who the winners in wireless on the handset side eight years ago were, we would have said BlackBerry and Nokia. Today’s leaders are Apple iPhone and Google Android on phones like the Samsung Galaxy. The wireless world completely changed over the last few years. So what can we expect on the network side going forward? Things change quickly on both the handset and network sides. Yesterday’s leaders are now struggling for survival. While Apple, Google and Samsung have roughly 90% market share, all the others squeeze into the last 10%. Today the next largest is Microsoft Nokia, which has only single-digit market share. BlackBerry has roughly 1% from what I hear. With that kind of transformational change going on with handsets, let’s consider the networks. Networks have gone through as much chaos and change, as well. Ten years ago the competitors were AT&T Mobility, Verizon Wireless, Sprint and T-Mobile US. They were all going through changes and challenges, but they were all competing well in the 2G, pre-app world. Then, over the next few years, things started to change. AT&T Mobility and Verizon Wireless continued to grow to 3G then LTE, while Sprint and T-Mobile US didn’t. That meant two competitors were rapidly growing while the other two were not. Now the wireless world is changing once again. Growth will come from new and different areas. AT&T Mobility and Verizon Wireless are still on the right track, but now it seems so are Sprint and T-Mobile US. What that means is all four are growing, but in different ways. What’s important to remember is there is a split forming in the industry. Both AT&T Mobility and Verizon Wireless are on one side of this split. They offer a variety of wireless and wireline services. On the other side is Sprint and T-Mobile US, which are straight wireless plays. So what changes can we expect going forward with wireless networks? Let’s take a closer look at these top four carriers. Everyone loves a good infographic. Also, everyone loves cell phones. And finally, everyone loves mergers and acquisitions (well, aside from the people who get laid off because of them). So most everybody should love the nice, neat display showing the last 10 years of wireless consolidation. Brought to you by Fierce Wireless, the chart takes a look at the rise of the Big Four as they gulped up regional carriers; together, Sprint, T-Mobile, AT&T and Verizon account for 90% of the market, and lots of that growth happened at the expense of other carriers. Interesting to note the relatively low amount of mergers/acquisitions seen by T-Mobile and Verizon over this time frame. Even more interesting, as Fierce Wireless reminds us, is back in 2005, only one out of every two Americans carried a cell phone. Now it's like every one American has two cell phones. Phil Cusick, JP Morgan Analyst: You've talked about small cells a few times. How do you think about building those? Do you want to build and manage your own small-cell networks? Do you want to own the fiber in that territory? Or you're just as happy to have somebody else do it? Fran Shammo: Yes, we lease a lot of fiber today. There are a lot of—there is a lot of competition actually in the fiber world. So we actually don't own a lot of the fiber that we have; we lease it. We own the electronics on both ends of it. But these are long-term leases, and we've done this for years, so this is nothing new to us. We don't need to own all of the small cells. We just entered into an agreement up in Boston for a 400-site densified antenna system that someone else built out, got all the zoning, has all the fiber. So we are leasing that from them. So there's a lot of alternatives out there today to create capacity, and it doesn't mean that I have to own and build and control everything. I can do that through third parties. I mean, it's similar to towers. I don't own my towers, but I still run my network off those towers. As long as I get the protections in the agreements that I need for the longevity, then it's a perfect solution for us. Phil Cusick: Since you bring up AOL, you want to start with the driver for buying that, and what that means about your future video strategy? We're slowly watching an industry evolve here, folks. Yep: slooooowly watching history unfold. It's a really slow unfolding process. Slug slow. Glacier slow. The-car-in-front-of-you-taking-a-left-turn-at-a-light slow. But still, change is coming as the Big Four carriers could soon see increased competition from non-traditional telecom providers like Google, who is heavily investing in voice-over wi-fi and wi-fi only data, and Dish, who invested heavily in spectrum licenses earlier this year. We don't yet know what Dish will offer, how they will offer it, or if they plan on teaming up with a traditional carrier, but they are aiming to become the only television provider to offer wireless voice, video and data services, according to an article uncovered by Yahoo! Finance. As I get ready to depart on my sixth mission trip, I reflect on a related question—one that is often posed to me: “As an owner of a successful company, how can you take time away from the office for mission trips?” I respond with a simple question of my own: “How can I not?” But I wouldn’t have believed that response when I took my first mission trip. In 2007, my church offered a trip to the Republic of Georgia. At that time, Towersource was undergoing moderate growth and, with just a handful of employees, we were very busy. I had my hands on most of the projects personally and was very involved in the business. Two weeks away from the company with absolutely no communication—email or phone or otherwise—seemed impossible and irresponsible. But I couldn’t ignore the opportunity; I had a calling. Despite the initial struggle of choosing whether or not to go, I made the temporary leap out of the business. And the trip truly did change my life and the life of Towersource. I set a plan in motion about a month before I left on the trip. I started delegating my projects to all the great project managers I worked with. Each employee jumped at the chance. To my surprise, my plan worked so well that two weeks before I left, I found myself with nothing to do. I left with confidence, knowing all would be taken care of. During the trip, I saw some devastating conditions and fell in love with the Republic of Georgia and the wonderful children, people, food, wine, and culture of the region. To say the least, the trip was a moving experience. When I returned after two-and-a-half weeks, I was ready to jump back into my normal routine at Towersource. I chomped at the bit to get back to work, the same need that most entrepreneurs would feel. While I feared the mountain of emails that awaited me, I was motivated to put out any fires that flared in my absence. Things were running smoothly and everyone was doing a great job. And when things are running smoothly and everyone is doing their job, you stay out of their way. I wasn’t needed on the projects that I left. I began to use my extra time to work on the business and not in it. I was able to look weeks, months, years down the line, instead of having to narrow my focus on immediate projects. And as I backed away from these former projects, Towersource continued, and has continued, to see great growth. Sometimes, people just need the opportunity to be leaders. If you totally remove yourself, the true leaders will step up to prove themselves. These new leaders were stretched and tested and because of that, they gained confidence. This confidence made a positive impact on the company as a whole. The team became stronger and supported each other more and more as they stepped out of their comfort zone and contributed at increasing level. And lastly, if you step away, you may discover another passion outside of the office. In addition to helping Towersource, the passion and energy I discovered in the Republic of Georgia boiled over to my family, and we soon found ourselves on a family mission trip to Ecuador. Since then, my daughter and I took another trip to Ecuador and we followed that up with another trip to the Republic of Georgia, where my eldest son joined the two of us. Next week, my daughter and I are headed to the Republic of Georgia again, while my older son is going with his school to Guatemala. I realize mission trips aren’t for everyone. I want you to discover whatever it is that will get you out of your comfort zone, push you a little, and hopefully help you discover your own passions and leadership skills inside and outside of the office. Forget microwave transmitters. Forget cell phones. We're thinking about the future. Deep space future. Well, we're not really thinking about it. Yet, anyways. But NASA sure is. They ask questions like, "How will Google Maps work in space?" or "How will AAA know where my spaceship is so they can come tow it?" "Some of the “revolutionary concepts” NASA detailed this week in its 2015 Technology Roadmaps sound like they are straight out of James Bond’s Q Branch – the research division that creates all of the super-agent’s really cool technology. Amongst the myriad concepts outlined in the Roadmaps – which lay out the new technologies and directions NASA hopes will steer its aeronautics, science and human exploration missions for the next 20 years -- were six high-risk high-reward technologies the space agency says are so “far out” that exactly how they would be developed is a not clear yet, NASA said." No, no, no. It's not clickbait. It's the truth: most smartphones are far from durable and have batteries lives far from the ideal length. We're in the telecom business, so we ultimately thrive when more people are connected to their phone. But it's hard to be connected when your phone is cracked and/or dead. Consider CNET's article a call-to-arms to demand smartphone manufacturers fix these fatal flaws. Check out the whole article here. Look around next time you're in an airport, on a train, or at a Starbucks. I bet almost everyone in your field of vision has a case on his or her phone. Of course, there's a class of confident souls who carry their phones naked, sans case. Many never have a problem. Others aren't so lucky, as evidenced by the number of people I see riding the New York City subway using case-less phones with cracked screens." While AOL is not well-known for wireless video, it has invested in a digital advertising platform. The company also owns valuable content brands, including Huffington Post, Engadget, TechCrunch and Makers. For Verizon, this is the latest in a string of acquisitions aimed at beefing up its digital media business. Last year the carrier bought Intel Media for Internet video technology, content delivery network EdgeCast Networks, and live video encoder UpLynk. Check out the rest of the article here." "There’s a reason why the devices in our pockets are known as “smart” phones. These sophisticated gadgets have brought the computing and internet revolutions from our desktops to our palms, and every year they grow more powerful. But our handsets aren’t the only things in the mobile world evolving. Just as our phones have changed from voice-centric to data-centric devices, the networks that connect them have undergone their own transformation. The most obvious change has been the rapid migration away from 2G and 3G networks to much faster 4G LTE technologies, making a 5 or 10 Mbps mobile connection the norm in the United States. But mobile operators aren’t just upgrading the radio technologies that connect your phone. They’re also changing the fundamental design of the network to meet these new data demands." Find the whole article here. Definitely worth a read if you don't have much exposure to small cell technology! We publish a bi-monthly safety newsletter. (That's once every two months, not twice a month, for the record.) We realize that we're five weeks late putting this up for everyone to see, but please don't tell our boss; he's a bear in the mornings before he has his coffee. If you'd like to get the newsletters in a timely fashion, you should sign up here. And don't try to answer the trivia question properly, because it's done already been answered. Top of the Morning, Extended Towersource Family! Welcome to issue #3 of the award winning* Towersource Safety Newsletter. Our goal is to communicate safety and proper protocol to our clients, vendors, and team members. And since we ain’t no April Fools, we’re dedicating this edition to a very serious topic in the telecom industry: fall safety. While you’re learning, don’t forget the contest hidden somewhere in this issue! How Much Do You Know About: Fall Safety? No, we’re not talking about safety in autumn. We’re talking about the best practices to avoid injuries—or worse—caused by heights. In the U.S. construction industry, falls are the leading cause of worker fatalities. On average each year, between 150 and 200 workers are killed and more than 100,000 are injured as a result of falls. The OHSA standard for fall protection states: “Each employee on a walking/working surface (horizontal or vertical surface) with an unprotected side or edge which is 6 feet (1.8 m) or more above a lower level shall be protected from falling by the use of guardrail systems, safety net systems or personal fall arrest systems.” If we drill down further into the OHSA rules, we learn there are two broad types of fall protection: fall restraints and fall arrests. Fall restraints include items like guardrails and parapet walls, while fall arrests stop workers should they actually fall. A personal fall arrest system must be capable of withstanding the tremendous impact forces involved in a fall. Thanks to Newton and his laws of gravity, a person without protection will free fall 4 feet in half of a second and 16 feet in just one second! Hitting a solid surface at that speed can cause dire injury or death. A personal fall arrest system will minimize the distance a person can fall and includes a full body harness, a shock absorbing lanyard or a rope grab—all attached to a sound anchorage point. The anchor placement is key, and should be able to support a load of 5,000 pounds. Or about three rhinoceroses. Or about 1/3rd of an African elephant. Speaking of Isaac Newton, what famous British academy of sciences did Newton head from 1703-1727? The first person to email wins a gift card and a Towersource polo! Woohoo! •Do tie off above your head. A six-foot tall person who ties off at the feet could free-fall as much as 12 feet. •Do place your anchorage directly above/behind your work area to avoid potential swing fall hazards. •Do use the shortest lanyard possible. The shorter the tie-off, the shorter the fall. •Do have anchorage points selected by a competent person. •Do not tie a knot in the lanyard. This will reduce its strength. •Do not allow more than one worker to tie-off to the same anchorage unless it is designed and approved by an engineer. •Do not allow someone else to rig your equipment unless you verify that it has been done correctly. We've got two happening blogs. For telecom news and information, check out The Source. For Towersource fun and merriment, check out Diversions.